Building Block of Brain & Eye Tissue. 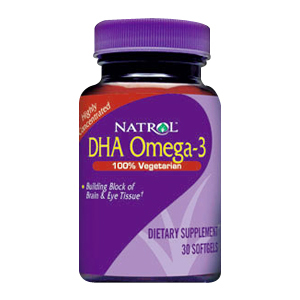 Neuromins DHA Omega-3 is a patented form of Docosahexaenoic Acid. This distinct Omega-3 Fatty Acid is vital for fetal development and cerebral functioning. Take 1 softgel daily with a meal. Pregnant/Lactating Women: After consulting your physician, take one twice daily. DHA (Docosahexaenoic Acid) 100 mg (from Oceanic Algae Source). Other Ingredients: Mixed Tocopherols, Ascorbyl Palmitate, Gelatin. Does Not Contain: Yeast, Wheat, Corn, Milk, Egg, Glutens, Sugar, Artifical Colors or Flavors, Added Sugar, Starch or preservatives. 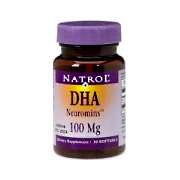 DHA 100mg is shipped in a discrete, unmarked package. Orders are processed immediately and usually take about 3 to 5 working days to be received. We do ask that you try it for 2 to 3 weeks to feel the full effects. Any information received is used only for order processing and shipping purposes. Your information, such as e-mail address, will never be disclosed to a third party.